This month Bright Club, where top academics perform stand-up comedy about their work, cracks open the books for some rounded humanities education. Simon Lock, who studies how science really works. They’ll be joined by a special musical guest (who we’re currently booking!). 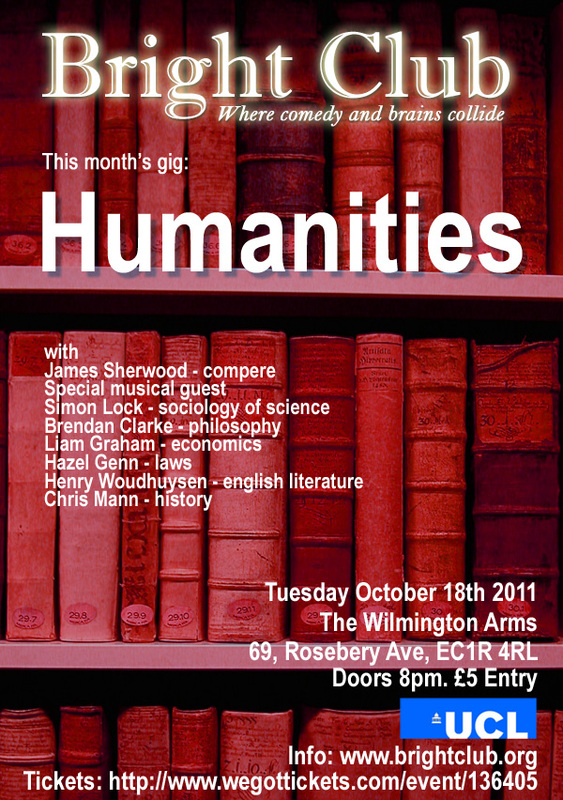 The gig is at the Wilmington Arms, our spiritual home. How very exciting. A special one-off collaborative Bright Club bringing together brains from two of London’s best collections of… er… brains. 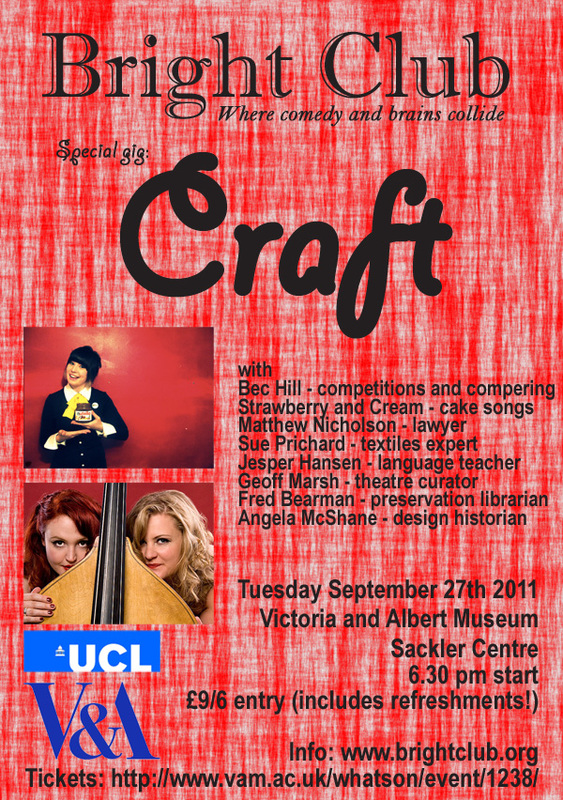 We’ll be looking at ‘Craft’ in all sorts of ways, with curators and University folk revealing the funny side of the things they work on. The gig is in the gorgeous Sackler Centre in the V&A, which is down in South Kensington (enter via Exhibition Road as the front entrance to the V&A will be closed). Our professional comedian on the night is Bec Hill, veteran of Bright Club: Museums and a dab hand at the craft of joke-telling and the craft of craft. In the music corner are Strawberry and Cream, singing filthy songs about tea, cakes and boys. And craft. Tickets are available from the V&A Box Office, online at www.vam.ac.uk/whatson or phone 020 7942 2211, priced at £9 or £6 concessions. Crucially, this does include some wine! Also, if you phone (NOT ONLINE) and use the code phrase ‘White Rabbit’ you can get the concession price even if you wouldn’t normally qualify as a concession!